The Miniature English Bulldog is not a breed recognized by the American Kennel Club (AKC). Instead, it is a breed under development; consequently, the origins of any one dog may be mixed. Potential owners will be wise to educate themselves about the breeding and characteristics of this new variety. The AKC sets the standard for all recognized breeds in the United States and registers purebred puppies from AKC registered parents. This registry ensures that any dog you adopt will be purebred. Reputable breeders will always have their dogs registered with the AKC. It takes many generations of controlled reproduction for a new breed to be recognized. For those under development or those from overseas, the AKC has the Foundation Stock Service (FSS), a project that allows new breeds to be recorded to ensure a purebred status as it develops. The goal is eventual AKC recognition. Over 60 varieties are listed as FSS breeds; the Miniature Bulldog is currently not one of those. The miniature version of this beloved and historic breed comes as a result of two possibilities. One possible origin is as a hybrid of two different breeds, the other is as a down-sized version of the Bulldog. Many of the smaller versions are the result of cross breeding between the Bulldog and another breed. In many cases, the other breed is a French Bulldog, known as a Frenchie, or a Pug. The miniature may even be a product of a cross between all three breeds, and this makes it a mixed breed dog. The disadvantage to this cross breeding is that you will not be able to register your dog with the AKC or any other reputable dog breed registry. You will also have to trust the breeder that you are, indeed, getting a dog from the parentage they claim. Another origin of the miniature is the selective breeding of small Bulldogs to achieve a smaller size. This is a similar process that yielded many of the small varieties we see today, such as the Toy Poodle or the Miniature Schnauzer. The problem here is that both the Toy Poodle and Miniature Schnauzer took many generations to reach their current size. Miniature Bulldogs have only been bred over the last two or three decades. The rapid down-sizing of a breed can result in health and personality effects. One positive about the down-sized version is that it is a purebred Bulldog and can be registered if its parents were registered. While there are many reputable dog breeders, there are, unfortunately, many disreputable ones as well. Some questionable breeders form their own breed registration organization as a way to appear trustworthy and official. The record keeping of these organizations is often haphazard or even nonexistent. These dubious registrations allow the individuals to sell animals as purebred when actually, they are not. It is important for potential dog owners to do their homework. All reputable breeders will offer references, health certificates and AKC registrations. If you are looking for a dog, be sure to contact the references and the breed organization, such as the Bulldog Club of America (BCA). There may be health issues with a Miniature English Bulldog. Since this variety has appeared so quickly and its origins are murky, it is difficult to predict what the long term effects will be on the dog. The English Bulldog is prone to mouth and nasal abnormalities, as well as heart deficiencies. These health issues may be exacerbated in the smaller size. Breeding for size alone, without taking health into consideration, can create an illness prone dog. The Bulldog is a lovable and respected breed. 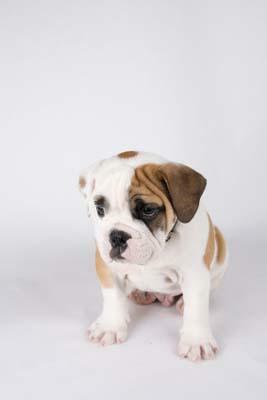 If you are looking for a smaller version, contact reputable Bulldog breeders and discuss your preferences with them. They will be able to guide you in selecting a healthy dog to fit your needs.